Lewis HAMILTON: I'm so happy right now. Thank you guys so much for all the support this year. Q: Actually, Seb, stay here, stay here. You guys have made this season epic. So, a little words; we don't often get to hear you talking together. How much has it meant to be battling out there wheel-to-wheel? Hamilton: It's been a real honour and a privilege racing against Sebastian. I've known him since Formula 3 days and he's always been an honest, hard-working racing driver and he has always raced his heart out. He did a fantastic job this whole season. There's so much pressure on us all, so don't every look at our shortcomings as anything less than us giving our best and Sebastian did. I know next year he's going to come back strong, so I've got to make sure I come back with him, but I'm really grateful for the time. Sebastian VETTEL: Well he's the champion and he deserves to be the champion. Yeah, it's been a tough year. I tried everything until the last lap, also today, I really enjoyed. Catching a little bit, a little bit, but I think he controlled the pace at the front. I would have liked it to be a little more wheel-to-wheel but yeah, a long year, a lot of races. Congrats, and as he said I will try, we will try, I think our whole team will try to come back stronger to make sure we give him a harder run into next year. But the final word: I think also well done to Fernando. I think the last years have been very tough for him, we've been missing him and we will miss him, so well done on his career. Q: Maybe the three of you all together, because this is multiple world championships between Lewis Hamilton, Sebastian Vettel and Fernando. Fernando, we wish you well in your retirement. You'll be coming back to visit Formula 1 though? Fernando ALONSO: Yeah, as long as I'm not commentating, you know like some of the ex-Formula 1 drivers! But yeah, it has been a pleasure racing with these champions. I feel very privileged, with you too obviously. Thanks for everything. Thanks Formula 1. I will always be a fan of this show. Q: OK, Fernando, you've been a true legend, enjoy the journey home. Lewis, you won the race, it's been an incredible season, but there was a slightly uncomfortable moment there where you pitted on lap six, you came out in traffic. We heard you on the radio saying 'hey guys, did you know I was going to come out behind this traffic'? Hamilton: Well, firstly just let me... as you already spoken of Fernando, he's a true legend. It's been a real honour and a privilege to race in a period of time where he has been racing. Before I even got to Formula 1 I was already watching him and admiring what he had achieved. I was asked all weekend 'will you miss him' and naturally I don't really quite feel like I miss another driver ever, but the sport will miss him, we will miss him and I will definitely will miss him being in the sport. Today, well, my engineers always talk about stopping super early. They're way too chilled behind the wall! And I was like "yeah, I've got a long way to and this doesn't feel too good right now". But it lasted long, once again they were calculated and correct and that's why we have to put so much trust in those guys. A big, big thank you to Mercedes and all of the team, all of the sporting partners. We wouldn't have had this championship without them. The championship wouldn't be the same without the fans, these guys that are travelling around the world, thank you so much for coming, appreciate it. Max VERSTAPPEN: Yeah, not an easy race. I had a problem off the start. Actually, the launch was good but then the engine went into like a safety programme and I had it again on the re-start afterwards. It was not easy but we managed to go back into a good position, putting pressure on the guys ahead. I think I stopped quite early but I had to, because I was on the hypers. Then we managed to keep the supersoft alive and I had good pace. But the last few laps were not that easy as there was a Toro Rosso leaking oil onto my helmet, so I couldn't really see where I was going, but at the end of course very happy to be third. Q: (Scott Mitchell - Autosport) Sebastian and Lewis, you both have plenty of experience winning world titles. We've seen Max up alongside you now quite a bit at the end of this season. Do you think he's ready for a world title push next year - and Max, how much have learned this year - and do you think you're ready to fight for the world title next year? Hamilton: How many years you been going now? Is this your third year? Hamilton: Jeez, you're getting old! Vettel: Veteran. You have some wrinkles. Verstappen: It's quite demanding and stressful. Verstappen: I might start with that, yeah. Hamilton: Max has been driving very well throughout the year and has shown his consistency and has been up here many, many times with us, so if his team does the job and delivers a platform with which he can compete even closer with us, then of course he'll be in the fight. I think he's finished third in the championship, right? Verstappen: No, two points behind - but at least I don't have to go to the Gala! Verstappen: We calculated that. I'm sorry. Unless I can do it as a community service day, and then I will go. Hamilton: No, you can't do that as a community service day. Vettel: No, no keep going. This is good fun from the outside. Yeah. On the track, I don't think he needs any advice. I think he's got all the ingredients. I think there's a couple of guys out there who have these qualitie and Max is certainly one of them. Yeah, I think we've seen that. I also remember from my time, it's important to have a competitive package throughout the season and Red Bull are certainly very, very strong and I think they put more performance to their car than any other team across the year, so obviously that allowed them to be very competitive, especially looking after tyres, etc., but yeah, I think both to be honest, Max and Daniel have proven that they can be very, very quick and very consistent so I'm sure more of him, he'll be up here. Q: And Max. Do you feel ready for a title push? Verstappen: I always find that a really difficult question, because you're so dependent on the package in Formula One. I mean, when I was watching back in the day to Formula One, it seemed like Lewis was ready for the title in his first year. Seemed like you were pretty quick. Of course, I think in a year you can always do things better but I think that's every year. Even if, at the end of the day, you win the title, there are always things which you can do better. So, yeah, even if we have a winning package, for sure there will be weekends where maybe you make a mistake, or it can be a better weekend overall. Hopefully first we'll have that package. Q: (Rebecca Clancy - The Times) Question to all three drivers. Just 112 days until we're in Australia. What are your plans now? What are you going to be doing over the winter break? Vettel: What are your plans? You seem to be counting the days. Can't wait? Q: Seb, why don't you start? What are your plans? Vettel: I don't know. Quickly done! If you need advice, I know how to do it. Verstappen: I like free practice. Vettel: If you want to go to qualifying and take things to the next level, you've got my number! It's the usual drill. We've got some events coming but, things that I look forward to, after this year, to be very honest, is to turn everything off. I think I need some time for myself. I think it has been a quite difficult and exhausting year for me. I definitely need a bit of a gap. I'm pretty sure, based on the last winters, that very soon, usually after 111 days, I'm very, very hungry again for the next race. As I said, getting away for a little bit and then focus. Obviously we still have the test coming up, so not yet time to rest - but yeah, I think this will be an important one with the tyres for the next year and then, I don't know. Just enjoy home. Enjoy my family, enjoy friends. Do stuff that you don't usually have much time for. Some DIY. Do some fixing at home. Small jobs. Hamilton: You do that stuff? Vettel: Yeah. A little bit. Vettel: Working on my bikes. Very slow process. Verstappen: It's like old-timers, right? Vettel: It's my very first bike, from when I was 15. Still restoring it. Verstappen: Tuning it as well, or just restoring? Vettel: Just back to the original. Hamilton: Does it start still? Vettel: Not at the moment. It's just a frame with all the bits next to it, waiting for reassembly, so...! Hamilton: I haven't made any plans yet - but looking forwards to family time. I unfortunately still have a lot of work to do until mid-December sometime - but excited for the winter, winter break and just getting time to spend with my sister and the kids and my Mum and my Dad. The whole switch-off thing. The seasons are getting longer and longer, so the importance of that period is getting more and more important. But, I'm going to stay in free practice for a little bit longer! Works best for me. Hamilton: No, I do DIY. I do like doing that. I'm usually breaking something because everything's fixed already, so I have to break it first and then I redo it. Q: And Max, what are your plans? Verstappen: I really want to be at home. I really like to spend time there and do stuff with my friends as well. I haven't really met up with them in the last two months, so yeah, it's good to catch up during December and early January, and then we'll start preparing again. Verstappen: A lot of free practice, yeah. Hamilton: You're staying in free practice? Verstappen: I'll definitely stay in free practice. 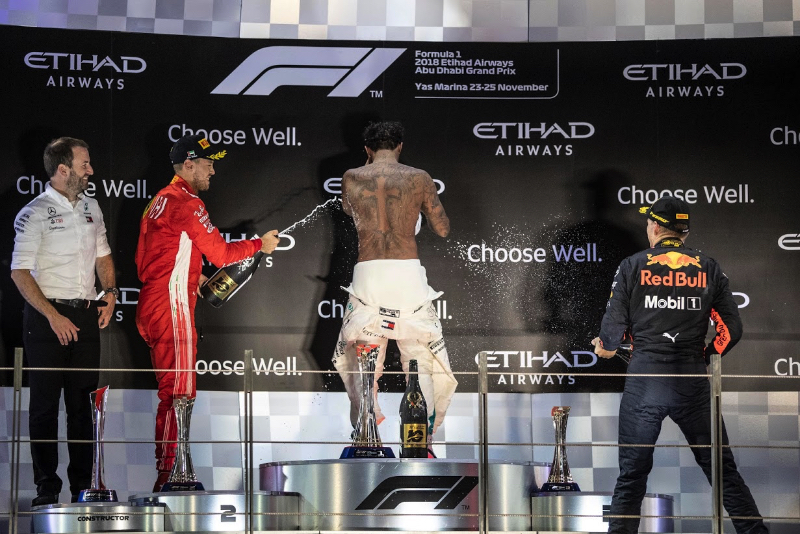 Q: (Phil Duncan - PA) Lewis, we saw you take your overalls off on the podium. Was that an advert for further free practice or is it just a new celebration? Hamilton: No, I just wanted to show 'Still I rise' on my back. Hamilton: But it definitely didn't go as I thought it would go but anyways, it was OK. But we'll see if it helps with practice! Not that I need any! Q: (Christian Menath) Seb, you said you know where you have to change within the team, until next season. What did you mean exactly, did you mean on the technical side or the team side or operational side? Vettel: Well, in the end it's a big operation, so a lot of small things that need to come together but I think everybody's there. We've mentioned it many times. Obviously we lost our path a little bit halfway through the year. Things didn't come together so obviously we did a step back towards the end of the year which enabled us to be more competitive again but I think we've understood what went wrong, we obviously tried to do a better job in the future, that was one key thing. On the other hand I think we had a lot of lessons, it was a tough year in general. I think the team is strong and the team has potential but surely it was a lot of things that happened inside the team. The passing of our chairman, Mr Marchionne obviously had an impact and was tough so I think it's up to us to look into every single detail and make sure we come out as a stronger group, enabling us to build a stronger package for next year and for the future. Q: (Jerome Pugmire - Associated Press) Just to follow up on that, Sebastian, do you think there's anything that you need to change personally, in your approach to driving, to take the next step next season? Vettel: I think, naturally, the year I've had, I don't think I ever any problems raising my hand if I made a mistake. I think, knowing as well, as a racing driver, how quickly things can go wrong, how quickly things could have gone differently this year, I think, yeah, I have to review a couple of things but there's other things that I think went wrong and don't need a lot of reviewing and not over-complicating things too much. I think I know what I need to do. Certainly, here and there, looking back I haven't been at the top of my game so... I look at myself first, I think I can be better than I was at times this year. Having said that though, I think we also had a lot of races where we got everything out of the car and the package and I felt that I did everything I could. I was happy with that. But yeah, that's how it goes, that's sometimes why you love racing and sometimes why you hate racing. Yeah, as I said, for now I need a bit of time just to shut things down and then I think usually...I don't know, it's a bit like skiing: maybe you learn something overnight before you go on the slopes again the next day. Obviously our night, it would help to hibernate, it would be stretching the night a lot longer than it is but I think we have a little bit of time to digest and analyse and yeah, I've always tried to improve things. I don't think I need to change things upside down but certainly in there I can adjust and get stronger.